Our Contribution to MAKE-IN-INDIA MISSION and to INDIA’S TECHNOLOGY SECURITY: LEDChip group has irrevocably & firmly put India on the GLOBAL LED map by setting up an Ultra-Modern All-Automatic LED plant with Billion LEDs capacity. LEDchip Indus P Ltd is a DIPP recognized STARTUP-INDIA enterprise, financed by SIDBI at Hyderabad. We have planned investment outlay of Rs200 Cr and signed MOU with Telangana Govt. We are continuously adding more capacity in next two quarters to reach 30 billion capacity in 2 years of operation The LEDs produced are LM80 certified where the LEDs are subject to 9 months of accelerated Life test under severe conditions of 105oC & 85oC & 55oC - - at temperatures that are far higher than Hottest part of our country and that are higher than Boiling Water temperature, have highest Lumens in their class ensured by the use of high grade Chips, Silicone & Phosphors. The highest standards of RELIABILITY are ensured automatically as all LEDs are produced untouched by the hand. The processes right through Chip bonding, to Gold wire bonding to Phosphor coating to testing-sorting-packing are carried out in air-conditioned dust free Class10K clean rooms, to meet highest & stringent standards. Our 30 years of LED manufacturing experience has helped our Indian operations to successfully set up global Supply Chain creating cost advantages in High quality raw materials procurement & costs. Our engineers with combined experience of 80 man-years, have excelled in bringing the yield above industry benchmark with faster turn around times. This way our overheads & wastes have halved, giving us cost advantage in pricing. The Fast rising Chinese wages & power and land cost cost, have no doubt added to our competitiveness. What's more, with local manufacture, we reduce the turn around time of massive energy-saving lighting projects from ‘months’ down to ‘weeks’. By adding in-house SMT lines, we can supply LED mounted modules to energy saving lighting project vendors and bring down the time to 'days'. Very few countries can boast of making LEDs Semiconductors. India proudly figures in this GLOBAL LED MAP, thanks to one Enterprise - LEDChip Group of Industries ! See the map below ( year 2013) prepared by Europe's largest technology market research company - YOLE ! ( See MAP in the Annex attached Click: https://goo.gl/images/lCw6gE India is woefully lacking in Semiconductor Manufacturing sector. Over last four decades unsuccessful attempts were made in setting up of Semiconductor packaging plants in Delhi, Mumbai, Gujarat, Srinagar, Chennai etc., of which three were for LEDs and rest for discrete Silicon components. However, none of them are operating today. LEDChip Group is sole manufacturer of LEDs in India imparting semblance of 'yes, we too can do it' confidence. We have clear roadmap and deep understanding of the LED technology and of the LED markets to make India be reckoned as well placed destination for the investments in Semiconductor ATMP field. LEDchip is associated with research projects at BARC, TIFR, IIT-Chennai, Calcutta Univ, Nagpur University, Kakatiya University, Veltech University in the LED technology field. In addition LEDchip has drawn on talents of Internees from over 50 Colleges and has given LED technology training to over 400 batches of electronic engineering colleges from all corners of India. The advent of Light Emitting Diodes (Power LEDs), whose efficiency & Life is 10 times that of traditional Lighting, brought disruptive forces into the traditional lighting industry. 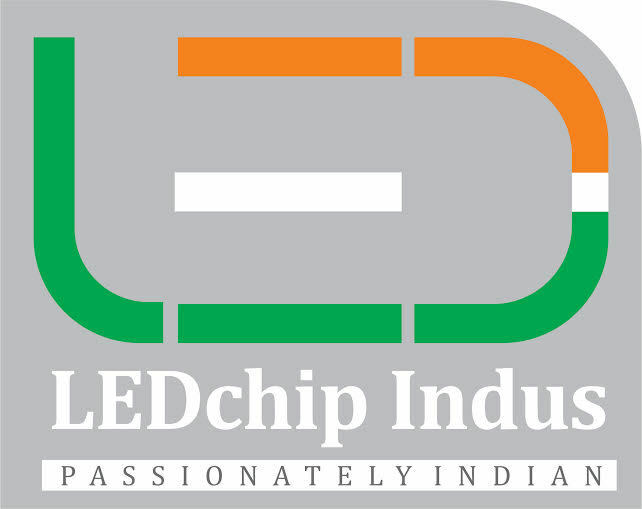 LEDchip group has attained leadership position by launching LED production in 1987. The recent expansion of the LED capacity to a billion LEDs is seeding of a new chapter in the history of Indian Components Industry & its growth.